The domain within your query sequence starts at position 3987 and ends at position 4033; the E-value for the LY domain shown below is 4.24e0. 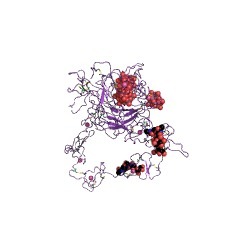 Type "B" repeats in low-density lipoprotein (LDL) receptor that plays a central role in mammalian cholesterol metabolism. 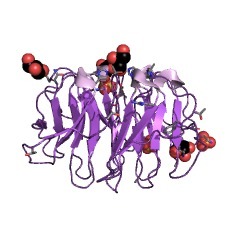 Also present in a variety of molecules similar to gp300/megalin. 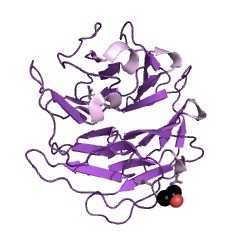 The ligand-binding domain contains seven or eight 40-amino acid LDLR class A (cysteine-rich) repeats, each of which contains a coordinated calcium ion and six cysteine residues involved in disulphide bond formation [(PUBMED:6091915)]. 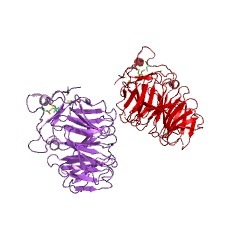 Similar domains have been found in other extracellular and membrane proteins [(PUBMED:7603991)]. The second conserved region contains two EGF repeats, followed by six LDLR class B (YWTD) repeats, and another EGF repeat. 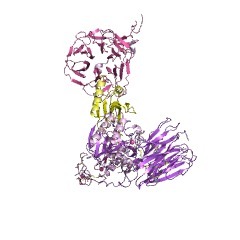 The LDLR class B repeats each contain a conserved YWTD motif, and is predicted to form a beta-propeller structure [(PUBMED:9790844)]. 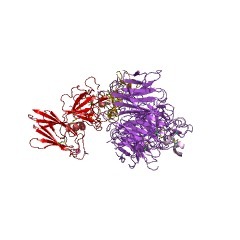 This region is critical for ligand release and recycling of the receptor [(PUBMED:3494949)]. 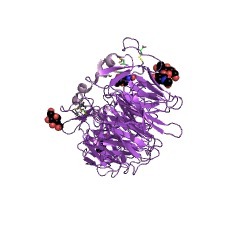 The third domain is rich in serine and threonine residues and contains clustered O-linked carbohydrate chains. 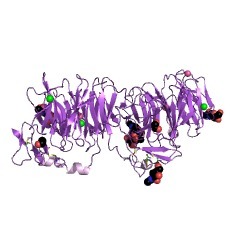 The fourth domain is the hydrophobic transmembrane region. 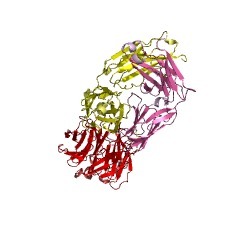 The fifth domain is the cytoplasmic tail that directs the receptor to clathrin-coated pits. 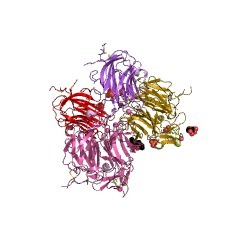 LDLR is closely related in structure to several other receptors, including LRP1, LRP1b, megalin/LRP2, VLDL receptor, lipoprotein receptor, MEGF7/LRP4, and LRP8/apolipoprotein E receptor2); these proteins participate in a wide range of physiological processes, including the regulation of lipid metabolism, protection against atherosclerosis, neurodevelopment, and transport of nutrients and vitamins [(PUBMED:17457719)]. 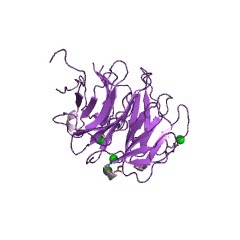 This entry represents the LDLR classB (YWTD) repeat, the structure of which has been solved [(PUBMED:11373616)]. The six YWTD repeats together fold into a six-bladed beta-propeller. Each blade of the propeller consists of four antiparallel beta-strands; the innermost strand of each blade is labeled 1 and the outermost strand, 4. The sequence repeats are offset with respect to the blades of the propeller, such that any given 40-residue YWTD repeat spans strands 24 of one propeller blade and strand 1 of the subsequent blade. This offset ensures circularization of the propeller because the last strand of the final sequence repeat acts as an innermost strand 1 of the blade that harbors strands 24 from the first sequence repeat. The repeat is found in a variety of proteins that include, vitellogenin receptor from Drosophila melanogaster, low-density lipoprotein (LDL) receptor [(PUBMED:6091915)], preproepidermal growth factor, and nidogen (entactin). 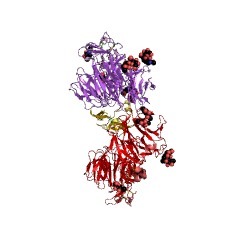 There are 128751 LY domains in 13670 proteins in SMART's nrdb database. Taxonomic distribution of proteins containing LY domain. This tree includes only several representative species. The complete taxonomic breakdown of all proteins with LY domain is also avaliable. Click on the protein counts, or double click on taxonomic names to display all proteins containing LY domain in the selected taxonomic class. 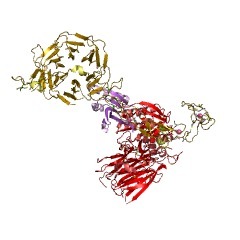 Complete cloning and sequencing of rat gp330/"megalin," a distinctive member of the low density lipoprotein receptor gene family. We completed the cDNA cloning and sequencing of gp330, the major kidney glomerular antigen for rat Heymann nephritis. 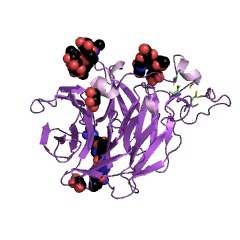 The deduced 4660-aa sequence, expected to constitute a mature protein of M(r) 516,715, consists of a probable N-terminal signal peptide sequence (25 aa), an extracellular region (4400 aa), a single transmembrane domain (22 aa), and a C-terminal cytoplasmic tail (213 aa). 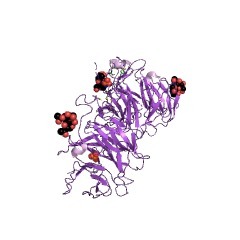 The extracellular region contains three types of cysteine-rich repeats characteristic of the low density lipoprotein receptor (LDLR) gene family--36 LDLR ligand-binding repeats forming four clusters of putative ligand-binding domains, 16 growth factor repeats separated by 8 YWTD spacer regions, and 1 C-terminal epidermal growth factor repeat. The cytoplasmic tail contains two copies of the (FX)NPXY motif, which represents a signal for coated pitmediated internalization and an additional similar motif. 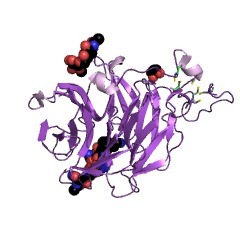 The overall structure of gp330 is similar to that of the LDLR-related protein (LRP)/alpha 2-macroglobulin receptor and shows even greater similarity to the Caenorhabditis elegans protein, reported as a homologue of LRP. 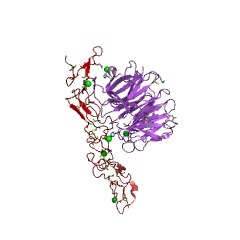 However, gp330 differs from these proteins in (i) the cysteine-rich repeat arrangements found in the extreme extracellular N- and C-terminal regions, (ii) the distribution pattern of cysteine residues in the YWTD spacer regions, (iii) the location of the RX(K/R)R consensus recognition sequence of furin, a precursor processing endoprotease, and (iv) the length and structure of the cytoplasmic tail. 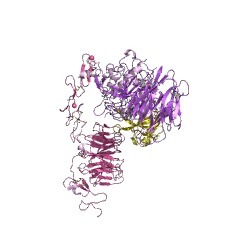 We suggest the name megalin (from Greek mega) for gp330, the largest plasma membrane protein identified so far in vertebrates. The cloned cDNA will be useful for studies on the physiological functions of gp330/megalin and for determining its role in Heymann nephritis. 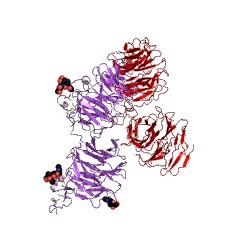 The human LDL receptor: a cysteine-rich protein with multiple Alu sequences in its mRNA. 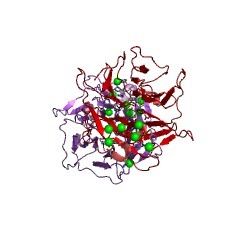 The nucleotide sequence of a cloned 5.3 kilobase cDNA for the human low density lipoprotein receptor revealed five domains in the 839 amino acid protein: 322 NH2-terminal amino acids, extremely rich in disulfide-bonded cysteine residues (15%) and including an 8-fold repeat of 40 residues that may contain the LDL binding site; 350 residues homologous to the precursor of mouse epidermal growth factor; a region immediately outside the plasma membrane, rich in serine and threonine and the site of O-linked glycosylation; 22 hydrophobic amino acids, spanning the plasma membrane; and 50 COOH-terminal amino acids, projecting into the cytoplasm. 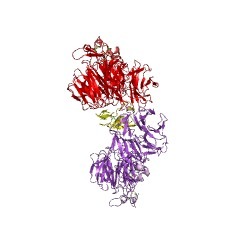 The mRNA for the receptor contains a 3' untranslated region of 2.5 kilobases that includes multiple copies of the Alu family of repetitive DNAs. Transfection of simian COS cells with the human LDL receptor cDNA linked to the SV40 early promoter resulted in expression of functional cell surface receptors. 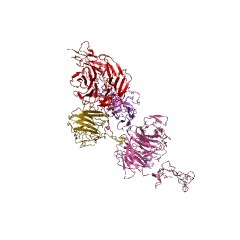 SwissProt sequences and OMIM curated human diseases associated with missense mutations within the LY domain. This information is based on mapping of SMART genomic protein database to KEGG orthologous groups. 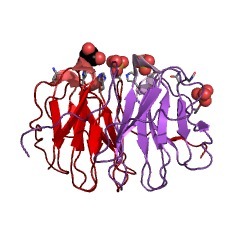 Percentage points are related to the number of proteins with LY domain which could be assigned to a KEGG orthologous group, and not all proteins containing LY domain. Please note that proteins can be included in multiple pathways, ie. the numbers above will not always add up to 100%.